I thought waiting 12 years for a StarCraft sequel was bad, but it turns out we've actually been waiting 13 years for a GoldenEye remake, and we didn't even know it was coming. Many companies have wanted to remake the game, and everybody else has wanted to play it, but it's always been held up by red tape. The James Bond License was bought by Electronic Arts in 1999, and then by Activision in 2007. However, the original GoldenEye 007 game for the Nintendo 64 was owned by Nintendo and Rare, and Rare is now owned by Microsoft, leading to a tragic custody battle over the years. Microsoft wouldn't let Nintendo re-release the original on the Wii's Virtual Console, and Nintendo wouldn't let Rare remake it for the 360's XBLA. Now we know why. Activision has their own remake ready, and it's exclusively for Nintendo's Wii and DS systems. "GoldenEye for the Nintendo 64 was a game that defined a genre. Now, after 13 years of gaming innovation, the legend is re-imagined. 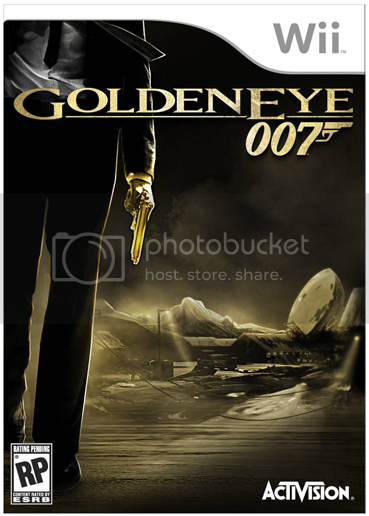 Developed from the ground up for the Wii, GoldenEye takes advantage of the latest technology to deliver the same intense experience with today's graphics and physics. Play a modernized version of the classic story with the new Bond (Daniel Craig), more lethal and cunning than ever as you take on missions around the world. Relive all the legendary moments from the original game: St Petersburg, the Caribbean and numerous other levels. Leverage the classic arsenal of weapons and gadgets as you fight Onatopp, Trevelyan and their adversaries, from the classic PP7 to the high tech assault rifle, sniper rifles and even the tank. The enhanced multiplayer experience offers 4 player split-screen like the original and introduces 8 player online matches. GoldenEye is 13 years better, are you?" But that's not all. Then Eurogamer got their own anonymous tip, learning that the game is about to be announced at E3 and will be released in November. It is being co-developed by the UK-based Eurocom and the US-based n-Space. Eurocom previously worked on another Nintendo 64 Bond game, The World Is Not Enough, and n-Space has worked on some Duke Nukem titles, Geist, and the DS Call of Duty games. We'll have to wait until E3's official announcement, but I think we can assume that Eurocom will be developing the Wii title while n-Space develops the DS title. I'm not sure how I feel about Daniel Craig sneaking into my pre-Craig Bond games, but then again Casino Royale was a remake of Bond's first adventure so maybe that makes GoldenEye post-Craig Bond? I'm not sure. Either way it's not that important, since Pierce Brosnan never fought Oddjob or Mayday, and it was still great fun in the 1997 game. Like all late 90's attempts at photorealistic humans and environments, the graphics did age rather poorly over the years. But the gameplay was as solid as they come, and very deserving of a facelift with today's technology. It will be interesting to see how the younger generation of FPS gamers, those who grew up on franchises like Halo and Call of Duty, react to the grandaddy of console FPS games making its triumphant return. It was the best-selling FPS on a home console for 7 years after all, until Halo 2 took its crown. And it's still frequently referred to as the greatest game adaptation of a film ever made. Personally, I can't wait to see the game's DK and paintball modes with today's graphics, or how many enemies they'll fit on the screen when a security alarm goes off. Klobbs in the Caverns anyone? RCP-90s in the Facility? Rocket launchers in the basement? 1 on 1, Aztec, Slappers Only? Speedruns of the Facility level are going to be all the rage, again.